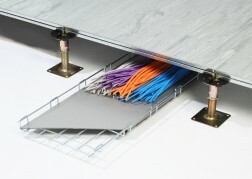 The Rigid option for basket tray or containment based cabling. Cablelay Rigid is a LS0H compressed foam sheet available in a variety of widths and colours to suit any requirement, many installers choose the use of colours to distinguish between cabling routes. The solid construction of Cablelay Rigid makes it a stronger alternative to Cablelay Matting whilst maintaining it’s lightweight properties. Cablelay Rigid is manufactured to the highest possible standard, being Class 1 and LS0H having the best fire performance results for a product of this type.